If you can’t escape to the islands, why not bring the islands to your table? Pineapples and pork chops are cooked together to create a fruity stewed dish that will make you feel like the vacation has come to you. In a small saucepan, combine the sugar, vinegar, pineapple juice, corn starch, and soy sauce. Bring to a boil over high heat, then reduce to a simmer and cook until clear and thickened, 2 minutes. Heat oil in a large skillet over medium heat. Add pork chops, season with salt and pepper, and brown on both sides, 4 to 5 minutes total. 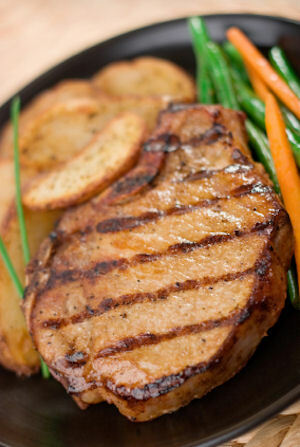 Pour sauce over chops, cover, and cook over low heat for 50 minutes, turning frequently. Absolutely delicious! My family loved it! Definitely making again! Oh what can I say! So so good. Will make again and again. Thanks love it! Can I add chunks to the juice? Very good - wish I would have doubled the sauce. Family loves it - will try it again and using chicken. Loved it! My boyfriend and I got in to such a rut making the samethings over and over but this was a great and very easy thing to make and like everyone else said you can spice it up as well and spice it down! This is a simple and very tasty meal. Have it egg noodles and a few chunks of pineapple. Easy to make & tasty. Chops stayed tender and my family liked the pineapple on the side. Was really good!! I am allergic to pineapples so I substituted orange juice. Recipe was so easy to make and very very tasty. Showing 10 of 16 total reviews and comments. Average rating of 4.43 stars based on 14 reviews. Summary: If you can’t escape to the islands, why not bring the islands to your table? Pineapples and pork chops are cooked together to create a fruity stewed dish that will make you feel like the vacation has come to you. Try this grilled tenderloin with roasted vegetables and a side of steamed rice. Sheer perfection found in sheer simplicity.